When laying out life plans and dreaming about the future, people don’t usually include drug addiction in their vision. Sometimes, a person gets entangled in addiction because of peer pressure, depression, or stress. Once he starts, he will likely have great difficulty overcoming the addiction alone, especially in the case of heroin addiction. This suffering person needs the help of friends and family for support and encouragement. Essentially, heroin is an opioid made from morphine. It comes in the form of a white powder or black sticky substance, and users will often snort the powder or inject it with needles. Although illegal, heroin grips people with a high addiction factor, keeping its users coming back at any cost. The reason for the high addiction is due to heroin’s rapid absorption into the brain. Once absorbed, it changes back into morphine and binds to opioid receptors that influence pain and pleasure. This process gives users the characteristic high that they’re looking for. What they don’t realize is that their addiction will affect many areas of their lives. Because heroin is so addicting, you can recognize it in a loved one right away if you know the signs. You must identify the problem and get help quickly in these cases. Look for the following signs if you suspect heroin addiction in a loved one. 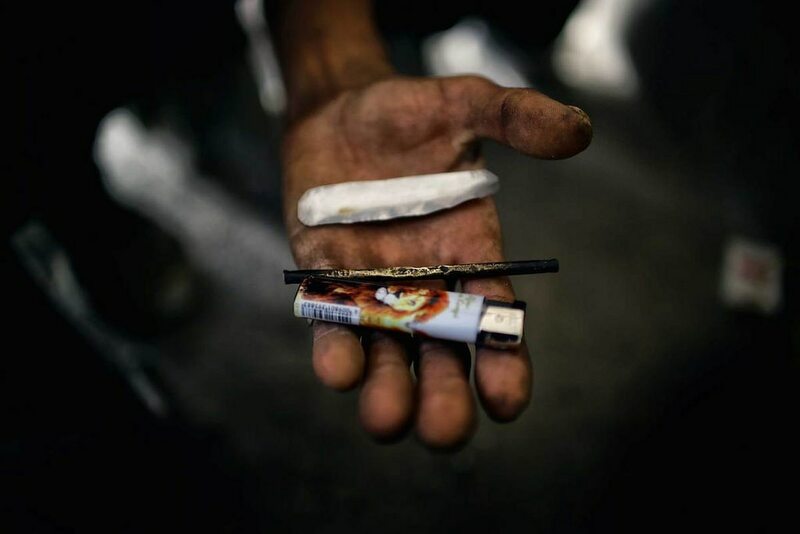 Heroin users like the drug due to its ability to invoke feelings of pleasure and euphoria. If a person is high from heroin, you will likely notice a flushed appearance along with an unnatural happiness. Once the effects wear off, however, the person may sink into depression, anxiety, or go through mood swings. Due to heroin’s sedative effects, a user will want to fall asleep often. If you notice a loved one falling asleep all the time or in unusual circumstances, you should watch for other signs of heroin use. Exacerbated by the drug’s sedative effects, an addict will often shirk important responsibilities. He may lose his job, disregard personal hygiene, forget dates, and lose interest in family or children. If your loved one is using needles to get the heroin, he may cover up his arms and legs to hide the needle marks. While this sign might go undetected for a while, watch for moments when people normally wouldn’t cover up. Your loved one may also avoid social situations where he might need to uncover, such as going to the beach. What Are We Doing about the Opioid Epidemic? Finally, you might notice that money goes missing around the house frequently. Your loved one will need to fund his behavior and may steal or borrow money often to do so. In addition, you may catch him lying about his whereabouts or financial spending to cover up his addiction. Apart from directly finding heroin, these signs do indicate that something is wrong. If your loved one starts these habits, you should keep watching his behavior and find professional help. Heroin addicts need strong encouragement and support. At this time, your loved one will need your help more than ever. Here are a few steps you should take if you suspect addiction. If the loved one is receiving money or free shelter from you, you have to stop enabling the addiction. He will see no reason to change unless you do. However, you can perform this step with graciousness. For example, instead of free meals and shelter, you can require the loved one to work for them. Refuse to give them money, and let other family and friends know not to do the same. Talk with your loved one and offer him your help with this problem. Be as soft as possible but as firm as necessary. Often, heroin users may face criminal charges, giving him other motivation to change as well. Heroin addicts need to go through treatment and support groups. They need the professional advice and medicine that will get them out of their addiction. Many times, surrounding themselves with these groups and supportive family will give them a boost into life again. Also, get teachers, supervisors, and other family members involved in case any suspicious activity is happening at work or school. While heroin addicts will need support to overcome addiction, they can get past it. You should learn to recognize heroin addiction signs and find professional help as soon as possible. Show addicts that you care without enabling them, and stay part of their lives throughout treatment. Together, you can make the addiction part of your loved one’s past, not his future.